the first Chromebook Pixel. The idea was to bring together the best in hardware, software and design to inspire the next generation of Chromebooks. It's been exciting to see how the entire range of Chromebooks—from classroom-proof to high-end—has made a difference to people at school, at home, and at work. Today, we’re introducing an updated and more powerful Pixel to fuel the imaginations of another wave of Chromebook enthusiasts. Plus, we’ve created a new, online Google Store where you can get the Pixel and other devices made with Google, all in one place. These days, packing for a trip means remembering to bring all your different chargers—for your phone, laptop, tablet, watch, etc. We think you should be able to use just one charger for all your electronics. So for the new Pixel, we’ve joined forces with some of the biggest names in the industry to create a new standard for charging, called USB Type C. The Pixel is one of the first products to launch with this new standard, with more Chromebooks and Android devices following suit soon. Not only does Type-C enable multi-device charging, but it also allows high-speed data and display over the same connector and cable. It’s small enough to work with smartphones, powerful enough to charge computers, and conveniently symmetrical (no more guessing which side is up!). Speaking of symmetry, the new Pixel doesn’t just have one Type C port—it has two, one on each side, so you can plug in wherever is convenient. Like the original Pixel, the new Chromebook has a high-resolution touchscreen, a sleek aluminum body, and smooth glass trackpad. We’ve also made a few other enhancements, including a new wide-angle camera lens. 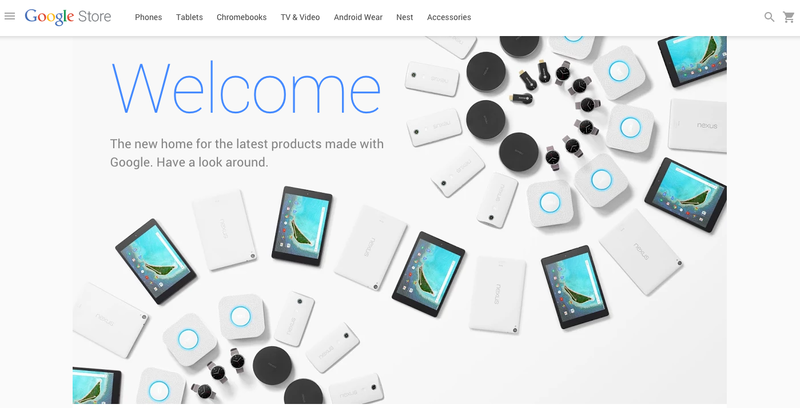 At store.google.com, you can shop Nexus phones and tablets, Chromecast and Chromebooks, learn more about newer technology like Android Wear, Nexus Player and Nest, and stock up on accessories like cases, keyboards and chargers. You’ll see how the Google apps you already know—like Search, Maps and YouTube—work seamlessly with all these products. The Google Store is available on your phone, tablet, or laptop, and right now you’ll get free shipping on everything** (consider it our way of saying hello). Once you’ve found the right device at the Google Store, you can still head to Google Play to find apps, games, music, movies, TV shows and more. If you recently bought a device on Google Play, don’t worry—your order info will automatically be transferred to the Google Store. See our Help Center for more information. The Chromebook Pixel is available for purchase starting today in the U.S. on the new Google Store for $999 and $1299 for the LS version. Come check it out, and see what else is in store. **Free shipping applies to the lowest cost shipping option. Free shipping promotion may be modified or discontinued at any time. Two years ago, we introduced the first Chromebook Pixel. The idea was to bring together the best in hardware, software and design to inspire the next generation of Chromebooks. It's been exciting to see how the entire range of Chromebooks—from classroom-proof to high-end—has made a difference to people at school, at home, and at work. Today, we’re introducing an updated and more powerful Pixel to fuel the imaginations of another wave of Chromebook enthusiasts. Plus, we’ve created a new, online Google Store where you can get the Pixel and other devices made with Google, all in one place.